Summary : Israel’s story about every civilian killed being the fault of their enemies is shown false by neutral investigations into every war it has ever fought. While some civilian deaths are collateral damage, evidence from every human rights groups' investigations shows Israeli forces also often target unarmed civilians, even when no fighting is going on. Over three thousand Palestinian civilians have been killed by Israeli forces since 2000, but only 6 Israeli soldiers jailed for killing civilians since 2000, the longest sentence being 7 months. History shows that “hiding among civilians” is not the tactic of the morally worse side but the worse armed one. The Zionist militias that later became the IDF used it against the British military in the 1920s to 1940s and two of the three main Zionist militias also targeted civilians in terrorist bombings. There’s an endless repetition by Israeli government and military spokesmen that Hamas are responsible for the death of every civilian killed by Israeli forces in Gaza because they are “cowards” who “hide behind civilians”, using them as “human shields”, while Israeli forces supposedly “do all they can to avoid civilian casualties”. In fact Israeli forces have always done a fair amount of targeting civilians during wars and even when there is no fighting going on – just as much as their enemies have targeted Israeli civilians. In the 1948 Israeli “War of Independence” Israeli forces operated Plan D, which involved massacring Palestinian fighters and civilians alike in towns across the former Mandate of Palestine in order to terrify as many of them as possible into fleeing into neighbouring countries, before refusing to allow them to re-enter the country. The historical evidence for this has been given in great detail by Israeli historian Ilan Pappe in his book ‘The Ethnic Cleansing of Palestine’, by Palestinian historian Walid Khalidi in his book ‘The Iron Cage’ and by American academic Norman Finkelstein, both of whose parents were holocaust survivors, in his book ‘Beyond Chutzpah’. The propaganda line about Israel’s enemies causing all civilian deaths was used in 2002 in ‘Operation Defensive Shield’ when Israeli forces carried out an offensive in Jenin and Nablus in the West Bank. Amnesty International, Human Rights Watch and Israeli human rights group B’TSelem found many of the 497 civilians, including 70 children, killed, were killed by Israeli bulldozers destroying their homes, or shot in the street by Israeli forces, including firing on ambulances and ambulance crews and killing a disabled man in a wheelchair. Israeli soldiers also used Palestinian civilians as human shields by forcing them to walk ahead of them (1) – (6). After the 2006 Lebanon War, Human Rights Watch found Hezbollah hadn’t fired rockets from villages Israel attacked, as Israeli spokesmen had claimed, but from hills several miles away. It also found Israeli forces targeted clearly marked ambulances across the country (7) – (8). In the Lebanon War, as in Gaza today, the Israelis made a great show of warning civilians to leave areas where “terrorists were operating”. Leaflets were dropped across the whole of Southern Lebanon ordering the entire population to leave for Northern Lebanon. Many had no cars to travel the distance fast enough. Many of those who did have cars were too scared to use them since Israeli forces were already bombing civilian vehicles, roads and bridges. After this Israel’s Justice minister Haim Ramon announced that “All those now in south Lebanon are terrorists who are related in some way to Hezbollah”. More intense bombing and drone strikes began, resulting in many civilian deaths, including the 2006 Qana massacre, which bore great similarities to the 1996 Qana massacre also committed by Israeli forces (9) – (11). In Gaza today the same warning propaganda is used. Leaflets are dropped ordering civilians to leave one area, but wherever they go there are Israeli attacks. They can’t leave Gaza as Israeli forces prevent anyone leaving into Israel or by sea. The border with Egypt is closed, as Hamas are allies of the elected Muslim Brotherhood government which the Egyptian military overthrew. Israeli forces also target the family homes of members of Palestinian militant groups for destruction (often killing entire families in the process). This makes many Gazans scared to leave their own neighbourhood, in case they end up being killed in an Israeli strike on the home of a militant who they didn’t know lived there (12) – (16). The “human shields” propaganda was recycled by Israeli spokespeople again in the 2008 to 2009 Gaza war (‘Operation Cast Lead) , which, like the current war, was more of a one-sided massacre. Amnesty found Israeli forces killed hundreds of civilians, many where there was no fighting, some in their homes, others ambulance crews. It said many couldn’t be “collateral damage”. Human Rights Watch found multiple cases of unarmed civilians waving white flags shot where no fighting was happening (17) – (19). Only two Israeli soldiers have ever been charged, prosecuted and jailed for their actions in Operation Cast Lead and neither on charges of deliberately killing civilians. One was given 45 days for “illegal discharge of a weapon” (into a Palestinian civilian woman and her daughter, killing her). Another got 7 months for stealing a credit card. (20) – (22). Even when there’s no fighting anywhere, Israeli soldiers regularly kill Palestinian children and teenagers who are unarmed, some in their own homes, playing in the street, or throwing stones when protesting against the occupation in the West Bank as much as in Gaza. This included two 16 year olds killed in May by Israeli forces. Another Palestinian teenager was among the eight Palestinians killed so far in West Bank protests against Israeli killings of civilians in Gaza. In the case of the first two the Israeli military came out with three different stories to try to deny the facts – that Israeli forces had not fired live ammunition (disproven by the autopsy), that CCTV video of the shootings showing Israeli forces fire on them had been edited (disproven by Israeli human rights group B’TSelem’s analysis of the video), and that Palestinian gunmen had shot the two boys (with zero evidence whatsoever) (23) – (28). For a list of Palestinians killed in the West Bank in the last 5 years and the circumstances see this page from Israeli human rights group B’TSelem (currently offline to people outside Israel due to a cyber-attack on its website, almost certainly by the Israeli government or military) (29). 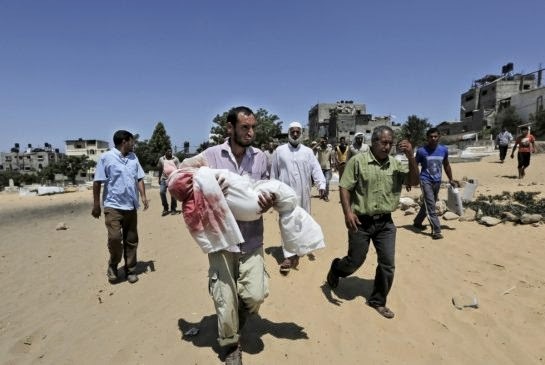 From 2004 to 2005 British and Palestinian doctors and journalists in Israel and the occupied territories, along with B’TSelem, found a disturbing number of Palestinian children being killed by Israeli sniper fire to their heads and chests in their homes, in school or playing in the street (30) – (34). Israeli soldiers later confirmed they had often been given orders to fire on any Palestinian they saw in the occupied territories, armed or unarmed, in their own homes or outside them (35) – (36). Not one Israeli soldier has been jailed or even discharged from the army over any of these killings. Human Rights Watch reports that “Since September 2000, Israeli forces have killed more than 3,000 Palestinians who did not participate in hostilities in the West Bank and Gaza, according to B’Tselem’s data. But the military justice system has convicted only six Israeli soldiers for unlawfully killing Palestinians, with seven-and-a-half months as the longest jail sentence, according to Yesh Din, another rights group.” (37). By 3.00 pm Israeli time on the 1st of august Palestinian armed groups had killed 3 Israeli civilians and 59 soldiers (all the soldiers having died since the Israeli ground offensive into Gaza began), while Israeli forces had killed around 500 armed Palestinians and over 900 civilians including 286 children (38). There have been attacks on civilian targets including strikes on over 100 UN buildings, including schools and aid depots, several attacks on every hospital in Gaza, hundreds of attacks on the family homes of members of Palestinian armed groups, as well as the family homes of Palestinian doctors with no links to any armed group (e.g Dr Nasser El Tatar), TV stations, and Gaza’s only power station (39) – (41). A reporter from the UN’s Channel 4 news in Gaza saw Israeli forces open fire with small arms and artillery on Palestinian civilians during the short-lived 7th July ceasefire when the civilians attempted to return to their homes and farms to check on them (42). If an isolated Israel was genuinely fighting for its survival against heavily armed Palestinian forces, or had suffered many deaths from rocket fire, at least some of the civilian casualties caused in Gaza, those which were the result of collateral damage and not deliberate targeting, might be more understandable. But in fact Israel has thousands of the most advanced tanks, fighter jets, armoured personnel carriers, drones and helicopters in the world, while the Palestinian armed groups have some light arms including rocket propelled grenades and mortars. They also have some inaccurate rockets – mostly pretty much “home made”, but some longer ranged Chinese or Iranian made ones. Israel also has the whole of NATO plus Egypt and Jordan as allies. The Palestinians have only Iran. Jewish resistance fighters in the Warsaw Ghetto wore no uniforms and hid in the middle of a city, because they had only light arms against a heavily armed military – and because, much like Gaza under blockade, there was nowhere else they could go. The Zionist militias during the British Mandate of Palestine in the 1920 to 1940s, like the Irgun and Lehi, whose members later became part of the Israeli military, used not only the urban guerrilla tactics used by the Haganah, but also terrorist attacks against both British and Arab civilians. These initially poorly armed militias were fighting the much better armed British military. Far from being outcasts in the new state of Israel, members of these groups became senior members of the Israeli military and government. Menachim Begin, a former commander in the Irgun, became the Israeli Prime Minister at the time of the Sabra and Shatila massacres. Yitzakh Shamir, a Lehi leader, also went on to become Prime Minister. So before Israelis had their own state, when they were up against much better armed enemies, they behaved exactly the same way Palestinians do in the same situation, up against the massively better armed Israeli Defence Forces. The supposed moral superiority of Israel’s leaders and military over Palestinian political leaders and armed groups is mythical.